Most Escape Rooms are started on a very tight budget with little or no money set aside for advertising and marketing. Finding ways to market your business that doesn't break the bank can be overwhelming. 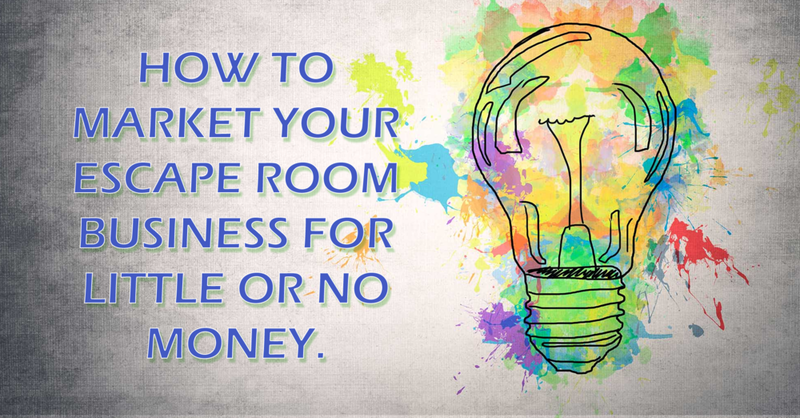 The average Escape Room Entrepreneur does not have a background in marketing and advertising leading us to make costly mistakes. The information that follows was originally presented at a seminar at my local North Carolina Small Business Network Center. Russ Seagle the Chief Executive Officer of the Sequoyah Fund presented these 42 low-cost marketing ideas. One of the most valuable tips I took away from the seminar was DON'T TRY TO DO EVERYONE OF THESE, pick a few that sound reasonable give them a try. The thing about marketing is that there is no one solution or magic bullet that is going to get people to your location. You have to do many of different things to get your name out there. As with anything in marketing, your approach should be multi-faceted. Not all of these tips will be for you or your business model. As the old saying goes "Don't try to eat the elephant in one bite." Try a few at a time and see how they work for you. Items we have adopted in bold. Where possible I will explain how we at Cracked it! Escape Games have incorporated these strategies. Business Cards and Post Cards are INEXPENSIVE to produce. Sites like Vistaprint and PSPrint are constantly running discounts and specials to print your collateral materials. You can design them yourself and upload your files or you can have a professional design them for you. Either way they are a great way to put your name in front of many hundreds of people. 3. Distribute flyers with SHAREABLE content. One topic & one Call-to-Action per flyer. Don't overload it. 4. Sponsor sports teams, clubs, dance studios, acting troupes, and SUPPORT THEM LIKE CRAZY! 5. Create Un-Brochures - handy, memorable, sticky. 7. Donate products, and make sure your business name is recognized publicly in some way. Never say NO! When someone calls and asks for you to donate free tickets to an event do it without hesitation. There are events and galas going on all the time in your community. Package your gift certificate or voucher in an eye-catching envelope with a piece of your collateral material attached. This will expose your Escape Room to markets you may not have been able to be exposed to before. Yes! Do this. Your vehicle is a rolling billboard for your company. How many cars pass by your location every day? How many miles do you drive every day? Why pay thousands of dollars for a billboard when you are already paying thousands of dollars for your vehicle. I highly recommend doing this. The general idea is that you will receive an email chock full of reporter queries. Most will not have anything to do with Escape Room's specifically. Use your life as a source for how to respond to a query and then fit your escape room into the conversation. I responded to a query from the American Express Open Forum regarding veteran's and Entrepreneurship. You can read that article in the Media Kit section of this page. 13. Create tip sheets (like this one), FAQ Cards, and targeted shopping lists for customers. 14. Offer public demonstrations of your product or service. 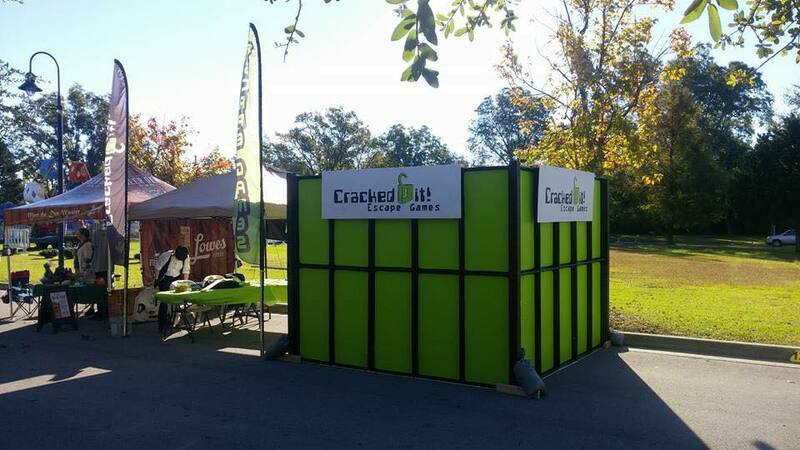 Take your game on the road with a portable escape room. This box is essentially a 10 minute escape game that is designed to introduce people to what exactly an escape room game is. 15. Create a referral program for existing customers. 16. Send hand-written "thank you" and/or "we miss you" notes. 17. Create a group of "insiders" who get exclusive offers and discounts. See my remarks for tip Number 2. You are your brand, your brand is you. When I am out doing business-related activities I am in a uniform. I am either in one of my company T-shirts with Cracked it! Escape Games prominently emblazoned on it or I am in a Lime Green Polo Shirt with my name tag. I am driving in a ford ranger with my name plastered on the every side of the vehicle. 21. Visit neighboring businesses. Learn what they do/who they serve. Ask could you be a BENEFIT to them? 26. Work with businesses that serve similar customers but don't compete. Ask how can you cooperate? Synergy is a buzzword in the business world. Defined it means the interaction or cooperation of two or more organizations, substances, or other agents to produce a combined effect greater than the sum of their separate effects. Much like Reese's Peanut Butter Cup, two great tastes that taste great together. Escape Rooms can team up with other businesses that share customer demographics. I have an ongoing relationship with a local apartment complex that has a frequent turnover of young military families. They keep my cards and brochures in their lobby in the things to do section. Likewise, I have their information available in my lobby. This arrangement is mutually beneficial and it costs us exactly $0.00 to do. 29. Hold a contest where customers design a new slogan, logo, color scheme, or jingle. 30. Start a blog and ask customers to contribute stories about how they use your products, pictures, etc. There are lots of benefits to writing a blog. The number one reason is that it helps your website be found. Without going deeply into Search Engine Optimization, blogging is a nearly free way for your Escape Room website to be found. Blogging helps you increase a number of search terms your website can be found with. As an example, this website is found not just using escape room related keywords. The scope of this blog encompasses a variety of topics that are related to the business of escape rooms and starting an escape room. Do you see what I did there? In the above paragraph, there are three "long-tail" search terms that will help this blog article be found by people searching for information about the escape room business and how to start an escape room. The key to using this is to not use them so frequently that your website can be penalized for keyword stuffing. 34. Get a professional name tag for networking and events. This is a must! Networking 101. People want to know who you are and what company you own or work for. At the Room Escape Conference in Niagra Falls this year I had many people come up to me because they recognized my name and company brand. A name-tag is incredibly inexpensive and pays off huge dividends. I get mine from HolmesStamps.com for about 11.00. they have magnetic backs and are custom printed. 35. Learn to sell - whatever it takes. Stop just taking orders, and make something happen. Never pass up an opportunity to talk about and sell your business. When you have groups leave your escape room, excitedly talking about doing it again. Ask them if they want to book another game in the future. Mention that your games are great for team building. Have a flyer handy that they can take with them. A maxim in sales is ABS. ALWAYS, BE, SELLING. 36. Print calendars with useful reminder dates indicated. 37. Write a press release for each new hire, new product offering, affiliations etc. Much like Help A Reporter Out, a press release can put you in front of news outlets that are hungry for human interest stories. I post my press releases in my media kit on this page. If a reporter is trying to get background information about Cracked it! Escape Games they can look at previous media articles and my press releases to get a good idea of what we are about. 38. Train your employees to be the best in customer service and product knowledge. The bottom line in the escape room business is directly tied to your level of customer service. If your guests do not enjoy their time with you, they will not come back. The key is to start with good people with great customer service skills. 39. Cross promote with other similar businesses in other markets. One of the most beneficial business decisions I ever made was reaching out to all of the other escape room businesses in the surrounding markets to form marketing partnerships. We have established promotion codes with each of those rooms and offer reciprocal discount codes with them. Offer to let their staff come and see your facility, play your games. Make friends with the other escape room owners and management teams. I get a fair amount of referral business from the other escape rooms that I am partnered up with and we actively promote all of these other escape rooms. 40. Identify your 10 best, most loyal, happiest customers, and offer to treat them all to breakfast or lunch. More tips can be found in my previous post: How to Market Your Escape Room - 10 Tips to Make your Facebook Page Work For You! 41. Establish a reputation as a customer advocate. 42. Ask at least one customer every week, "What do you wish we did better?" "What really chaps your hide about companies like ours?" "What do we do that keeps you coming back?"